Dead Rhetoric: I came across an interview where you said you had sung on The View. How did that happen? Braun: Yes, I actually got engaged on The View, and I’m the only one to ever make Barbara Walters cry on national TV. I was living in LA at the time and was moving back home to New Jersey. My wife-to-be had a job with American Airlines so she was stationed back in New York. I was originally going to propose on the scoreboard at Yankee Stadium. The producers of The View actually called up Yankee Stadium, knowing that people do engagements on the screen. So the producer called me up and started chitchatting with me and asked me if I wanted to do it and what I did for a living. I told her that I was a musician and a singer so she asked me to sing for her and she said I had to come on the show. It was like two weeks later, I told my wife that I was going on The View for a show on struggling artists. They sent a car for me and sent a car for her. They ended up doing something with the audience where they had everyone stand up and narrowed it down by asking more and more specific questions until she was the only one person standing. So they brought her up and chatted with her for a few minutes. Then they asked her if she recognized the voice behind the screen and I sang for a few minutes. Then I broke through the screen and the rest is history. It was a very cool experience, and they wanted us to have our wedding on the show. But it got to the point where you could only have so many people there and it was only a 15-minute segment so it ended up not being worth it. But they ended up taking her shopping in Manhattan and buying her wedding dress so that was cool. 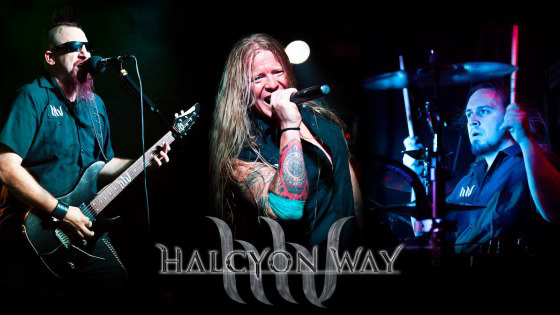 Dead Rhetoric: Halcyon Way has done a lot of touring with “older” bands like Fozzy, Fates Warning, and Saxon. Given the band’s musical direction, is it harder to sway that crowd at all? Braun: Definitely! While I love all those bands, we are much heavier. We were out on tour with Delain in Europe and the first few nights we would come out with this super heavy song with primarily death metal vocals and people would look at us like we had three heads because the other 2 bands had chick singers. We had to revamp our set list and put the softer songs up front and ease them into it. It’s been real hard; I’d like to go out with more modern bands. If we could go out with a band like Trivium, we could totally slay. But it’s hard to get onto those kind of tours. But maybe the right doors will open with this one. We’ll get that chance in time. 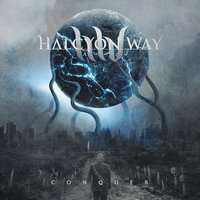 Dead Rhetoric: Halcyon Way does a lot of licensing; do you think that branding is important, even within the metal genre at this point? Braun: We are doing anything we can to get the name of the band out. It’s a big world out there and we are competing against 90,000 other metal bands. Any way that we can get our stuff out there, it’s going to be better for us. The other day, we got an email from some motorcycle club that wanted to use one of our songs as their chapter’s theme song. We’ve been on extreme hunting shows and some indie channels too. Dead Rhetoric: The only time I’ve come across it was when Mutiny Within made a song for a TV show and I wondered why more bands don’t get involved with that, if only to get your name out a little bit. 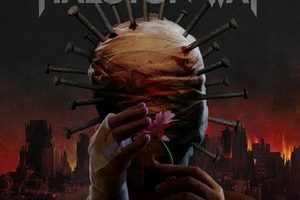 Dead Rhetoric: On your official site, you have a street team and it says become a “Nailhead,” how did that name come about? Braun: When we were in the UK for the first time, there were a handful of people that just fell in love with us, and said they wanted to form a UK street team for us. It’s gone from there and we have them now in Illinois, Atlanta, and Dallas and it’s starting to spread out. But it was really started by a few die-hard fans that became friends in the UK. 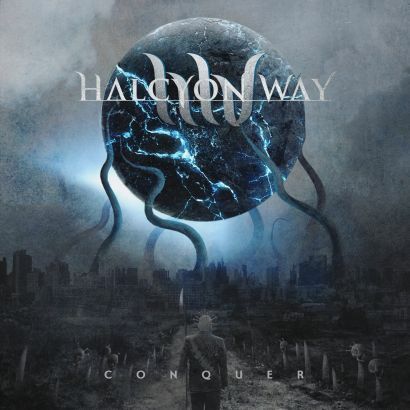 They came up with the name, which if you look at our artwork, there is guy with nails in his head on most of our covers [including Conquer]. He’s kind of like our Eddie. It also kind of helps with branding as people get to know who he is. 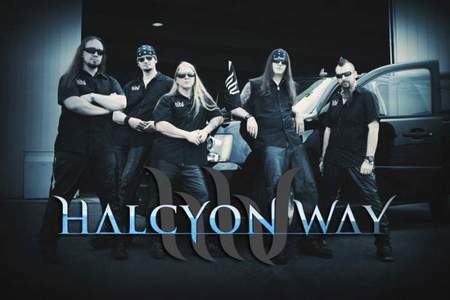 Dead Rhetoric: Does Halcyon Way have anything planned for the rest of the year? Braun: Yes, but it’s got to go through the proper channels to get released. But we will be going to Europe at the end of October and be back in the States in the beginning of December. Dead Rhetoric: Any plans for touring in the US? Braun: I hope so. I would hope that after the holidays we could set up a spring tour and maybe get over to the big European festivals next year, like Bloodstock or Wacken.